Glass staircase will add a simple, yet innovative and stylish touch to commercial as well as residential interiors. 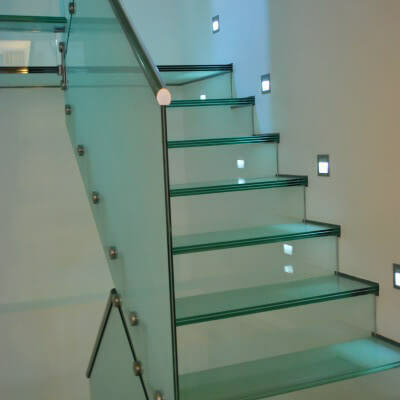 At Exclusive Stairs, we are offering a plenty of solutions, combining glass panels and stainless steel connectors to make sure your stairs will suit the décor of your house or office perfectly. Glass balustrades can be of full height from the floor to the ceiling, from the bottom of the steps to the ceiling, or from the bottom of the steps to the handrail height. A wide array of shapes and colours of glass allows you to create your very own staircase. We can also incorporate your logo into the treads and the landing to promote your business and inspire awe among your clients. But looks are not everything! We also make sure that your glass staircase has anti-slip treads, and it is safe and lasting.